Greenways are similar to side paths in that they are 10 to 14-foot wide, paved paths designed to accommodate both pedestrians and bicycles. 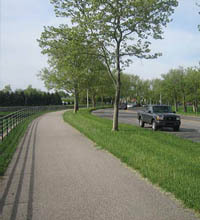 Whereas side paths are next to streets, Greenways are located along natural features, rail lines, or utility corridors. They generally have fewer road crossings and therefore fewer conflict points. 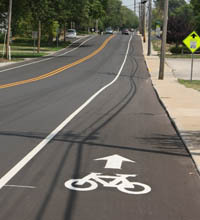 A bike lane is a portion of the roadway that has been designated by striping, pavement markings, and signs for the exclusive use of bicyclists. Bike lanes allow cyclists to ride at a comfortable speed without interfering with other traffic. Bike lanes help to make drivers aware of bicyclists’ right to the street and facilitate predictable behavior and movements between cyclists and motorists. A bike lane is usually located adjacent to the vehicle travel lane on the right side of the street. 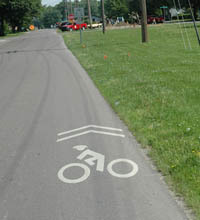 A “Sharrow” or Shared Lane Marking is a painted bicycle symbol and two chevrons on the travel lane. Bikes are allowed to use any street, but sharrows indicate an area where bicycle use is especially heavy. 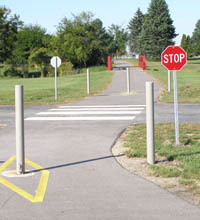 They are commonly used in cases where a street cannot accommodate a bike lane. Sharrows can also be used to show the recommended positioning of cyclists in a restricted area like an intersection. Signed bicycle routes are streets or roads that are recommended for use by both bicycle and motor vehicles without a designated facility. These routes are indicated exclusively by signage, and do not have a dedicated portion of pavement. These signs identify bike routes in Kosciusko County. They were identified by the Kosciusko County Velo Cycling Club as recommended rides based on road conditions, scenic value, and destinations. This sign is a simple reminder that bikes and automobiles have equal rights to the street and must respect each other’s use of the road. This sign is also a reminder to everyone that bikes have a right to as much space on the street as they need to ride safely. This signifies a route as suitable for bike traffic. This sign points to a destination and usually gives a distance in miles.